The most stylish and luxury limo bus rental company in central Texas. Whether you are looking for a night out on the town, corporate outing, special event or need transportation to Salt Lick Bbq, Austin TX Red Star Luxury Transportation has the buses to meet your transportation needs. 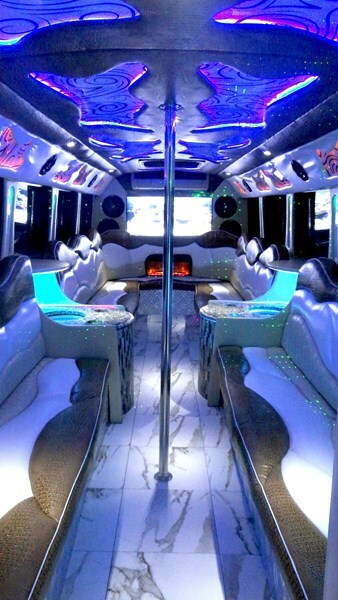 Our unique party buses are custom built to provide our clients the most exciting, comfortable and enjoyable time possible. All of our bus and suv rentals come with a friendly professional CDL licensed Chauffeur, so that you can have a worry free and safe trip to all of your favorite destinations. Red Star Luxury Transportation is locally owned out of Austin TX, and we work with each of our clients to give them what they need. Red Star Luxury Transportation currently services the Austin, Round Rock, Pflugerville, Georgetown, Taylor, Cedar Park, Westlake, Lago Vista, Lakeway, Bee Cave, Bastrop, Kyle, Buda, San Marcos, New Braunfels, Canyon Lake, San Antonio TX. My experience with Red Star Party Bus was very satisfying. All who rode the bus complimented how nice and comfortable the bus was. It was a very satisfying and happy occasion. The driver was excellent and very understanding. We thank you for your service. Please note Red Star Luxury Transportation will also travel to Manchaca, Del Valle, Buda, Kyle, Cedar Creek, Dale, Manor, Mc Neil, Pflugerville, Driftwood, Lockhart, Maxwell, Round Rock, Cedar Park, Elgin, Red Rock, San Marcos, Spicewood, Leander, Bastrop, Dripping Springs, Wimberley, Martindale, Coupland, Staples, Fentress, Hutto, Mc Dade, Prairie Lea, Rosanky.